What do you do when you have an emergency plumbing problem in your East Orlando home or workplace? If an unexpected leak or burst pipe occur, your home will be filled with wastewater or sewage. Your entire surroundings will be filled with foul odors. Your sinks and toilet will be rendered unusable. What’s more, your walls and carpet will be damaged. When these happen, rather than sitting through a long weekend, waiting for the aid of an unreliable repairman, the best thing to do is to call on a qualified East Orlando Plumber to fix the problem. In case you are looking for a reliable East Orlando Plumbing contractor to help restore your damaged plumbing system to optimum working condition, you can always turn to A1 Service Plumbing to get the job done. For several years now, we have been providing fast and effective solution to the emergency plumbing problems faced by individuals and businesses in East Orlando, FL, and nearby environs. All our services are carried out with a high level of professionalism. A1 Service Plumbing is the top brand emergency plumber serving East Orlando and the surrounding communities. If it leaks, clogs, blocks, or bursts, our skilled technicians are available around the clock to provide confident service and skilled professionalism for any project, large or small. A dependable East Orlando 24 hour plumber delivers prompt responses and accurate repairs every time. As a highly qualified East Orlando Plumber, we understand the need for immediate attention when plumbing in your home or business goes unpredictably awry. Instead of suffering from damaged pipes that can sometimes increase in disrepair with every passing hour, trust a local company that is dedicated to speedy worthwhile service. Since 1954, we have stood behind our workmanship, guaranteeing exemplary service, uncompromised quality, and affordable pricing to all of our satisfied customers. Principal owner, Mike Macherone Sr, adopted the company name “A1” in 1977 to better illustrate the gold standard of commitment and service upon which the company was founded. The dedicated result is the growth from a modest local shop to a flourishing and full functioning facility of over eight thousand square feet. 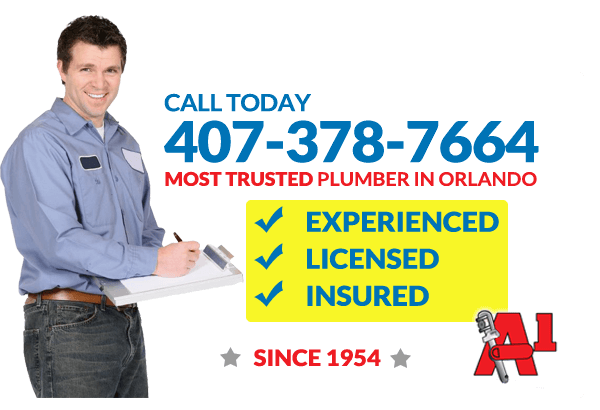 Being licensed and insured, with skilled technicians qualified and trained for all manner of extensive work, is part of our dedication to remaining the most reliable 24-hour plumber in Orlando. Plumbing concerns are an immediate concern, whether fixing cold water in your shower at home or a faulty bathroom in your place of business. We supply both residential and commercial emergency plumbing in Orlando, guaranteeing the work with our own warranty to back up any manufacturer’s warranty. From major installations to minor routine maintenance and everything in between, our technicians are equipped, trained, and certified to work on any make and model. Whether you are looking to fix issues like wall leaks, slab leaks, toilets, lavatory sinks, water heaters, or hidden leaks, we are the perfect fit to get the job done. We also offer services such as electric sewer cleaning, and sewer jetting. We are a trusted East Orlando Emergency Plumber you can always count on to come to your aid. At A1 Service Plumbing, our services are highly professional and transparent. We provide our customers with a detailed written analysis of the current piping system and a complete estimate upfront. We ensure that every step of repair is clear and understandable. Poor piping that results in discolored, foul tasting, cold water is more than just a problem for your health and property, but also places considerable strain on your budget, potentially running up costly water bills. These problems often arise at inconvenient and unforeseen times, making access to a 24-hour plumber in East Orlando critical to every resident. Call today for your swift estimate. We are your East Orlando Emergency Plumbing that will provide a fast, effective, and long-lasting solution to your recurring plumbing issues.